Like on TV Only MUCH Cheaper! What This Offering Will Do For You - Locate, analyze & evaluate private notes and arrange the sale of these so the note seller can get all cash now instead of taking payments over time. All the info is provided to do this business and it can be run from your home.
. The Buying and Selling Private Paper or Notes has gained in popularity in recent years, especially with the TV infomercials touting how great this business is. They are right, each year millions of dollars of private paper is created when selling real estate, businesses, cars, boats and a myriad of other assets. Until recently, the holders of this paper had a limited marketplace to sell these investments for all cash in one large lump sum. As a result they had to accept their monthly payments for the duration of the note term. Today there is a huge market of buyers for this privately created paper. Buyers of this Private Paper are enticed by the large yields they can achieve through owning this Paper. Buyers on the west coast are buying notes in Florida and vise versa. This can be a national business run successfully right out of your home. Buyers and Sellers are getting together for these sales from all across the country and much of this activity is controlled by "Note Brokers" who bring the buyer of the note and the seller of the note together. We have been involved with note brokering since the mid 1980s. There is no licensing that I know of to enter this business, but check with your states attorney general if you are still concerned. * Real Estate Notes - basically any form of Seller Financing secured by real estate; trust deeds, mortgages, wrap-arounds, AITD's, seller 2nds, land contracts, lease options and the list goes on. * Business Notes - When a small business sells, typically the seller is involved in Seller Financing of the Business Sale. These notes can be secured by real estate, business equipment etc. * Lottery Winnings - Often the winner of a lottery is paid their winnings over 20 years; we can provide the lottery winner with all cash today! * Any Form of Structured Settlement - Insurance Settlements, Law Suit Settlements, Divorce Settlements etc. where a principal amount is paid out over time. * Personal Property Notes - on cars, boats, airplanes etc. Any Private Note created most probably can be sold for all cash today. 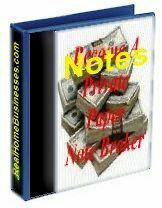 The Note Brokerage Business is quite simple really, when you have the know-how and the software. You find a private party who is accepting payments on a private note who would like to receive all their cash today in one lump sum rather than receiving the monthly payments, and list the note for sale. This is a finders fee arrangement whereby the note owner/seller agrees to pay you a fee for marketing this note and agrees to pay you a fee upon it's sale. Next you market the note to potential note buyers until you have a cash buyer with terms suitable to the note seller. You have this buyer sign a non-circumvention agreement agreeing not to buy this note without your participation and you bring the buyer and seller together. A typical deal may have the buyer offering $100,000 for the note and you negotiate a sales price of $95,000 with the seller and keep the difference or $5,000 as your fee. Once the pertinent data has been collected from the Seller and submitted to the Buyer, you simply wait the customary 2 to 3 weeks for the sale to close and collect your check. 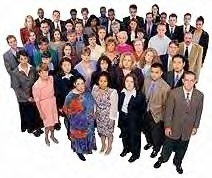 These are a small sample of the hundreds of satisfied customers we have heard from. We hope to add your byline in the near future..
* Complete explanation of how the business works, how to conduct it, why your services are needed and how to avoid the common mistakes that cost you time and money. * Names, addresses, phone numbers and email addresses of National Note Buyers including US who will often purchase or arrange the sale for you; and yes, we may purchase your note or have buyers for it too! 16 Files ready to put you in your own profitable business tomorrow! How Much Can You Make Brokering Notes? Typically your fees will range from 5% to 10% of the current note balance. As the dollar amount goes up the fee structure goes down. An average real estate note of about $100,000 in face amount would generate a fee in the range of about 5% or more. We provide some benchmark fee percentages based upon the dollar amount and type of note in our material.